At the DARPA Robotics Challenge last week, a robot drove in on a red UTV. The vehicle slowly came to a halt on the obstacle course as it reached the door of a simulated disaster building. The driver, a six-foot-two Atlas humanoid, sat motionless for many minutes. About half a dozen researchers wearing blue "TEAM MIT" vests looked on, like anxious parents waiting for their child to pick up the pace in a crucial race. When their robot eventually turned its body to get out of the vehicle, it shook uncontrollably for seconds before it leaped out of the car and fell flat on its face. The crowd collectively gasped and a loud aww rippled through the stands at Fairplex in Pomona, California. In that moment, one of the front-runners in the race became the underdog. "I'm heartbroken that our robot fell," said Russ Tedrake, professor at MIT's Computer Science and Artificial Intelligence Lab. "We've spent so many hours with this robot. I don't think of it is as human or anything but I love this robot. To watch it crash face first into the ground... I didn't know if it was going to get up." Atlas showed persistence. Soon, it was back on its feet, with the help of its team and a metal rig, but it broke its right wrist in the fall. Most of the remaining tasks in the race required hand movements; the robot needed to cut through a wall, pull a lever and rotate a valve. Luckily, the team and their software had the required intelligence to improvise. After the fall, when the robot's encoders went nuts, the team detected that failure and switched sensor modes. "We told the robot your right arm is no good, use your left arm," said Scott Kuindersma, Team MIT's project and control lead. "So we were able to pick up where we left off." The crowd roared as Atlas walked up a four-step stairway to complete its first run. The human-machine relationship is usually perceived as one of codependence. But at the recent robotics race, there was constant give and take between the human operators and their corresponding machines. The operator sat behind a purposely degraded link that restricted sensor feedback and communication, since that might be the case in the event of a real disaster -- the sort of scene the robots are being trained for. 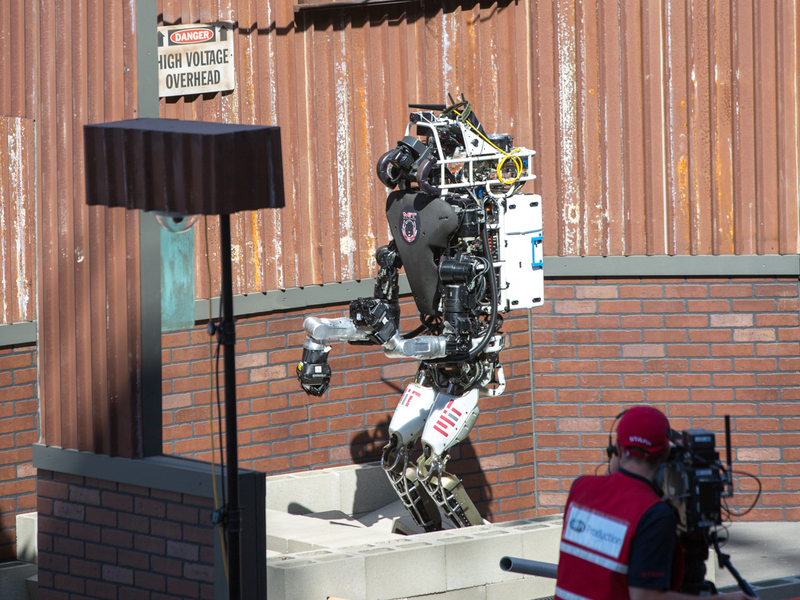 When Atlas was out on the field, it wasn't remote-controlled by an operator. It relied on its own perception codes that pointed out objects in its environment. The codes then became the cues for the optimization algorithm that ran through the metallic veins of the machine. 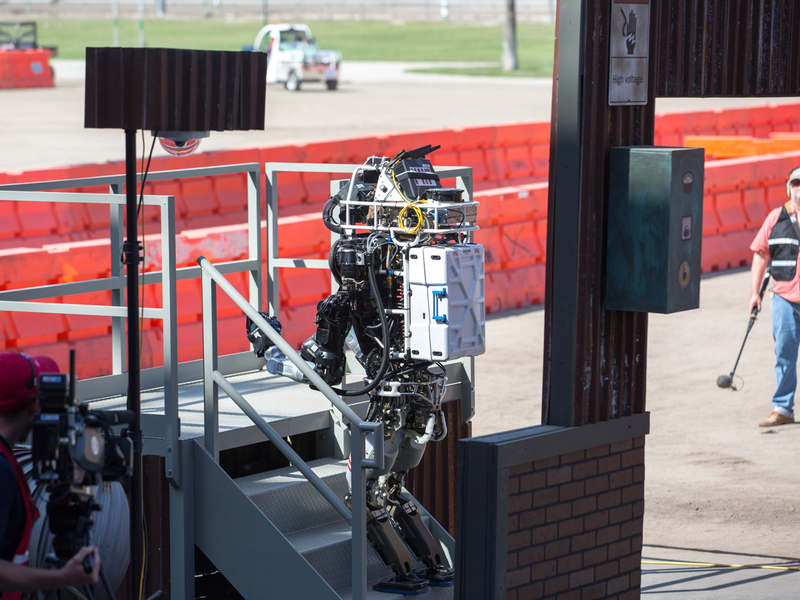 The Atlas was one of seven advanced humanoids supplied by Boston Dynamics to the participating teams. Like most other teams, MIT stripped the pre-loaded software and replaced it with algorithms that gave the robot its own unique personality. "Our Atlas perceives the world differently and walks differently," said Kuindersma. His team developed a software system for bipedal locomotion, state estimation and perception. "The hardware, in principle, is capable of running fluidly through the environment, doing precise and delicate manipulation and carrying heavy loads," he said. "I think the limitation is fundamentally a software problem. So it's really on us, computer scientists and control engineers, to raise the capabilities through software to make them do the things that they're capable of doing." At the end of day one, the team spent the night repairing the damage –- the broken wrist, the faulty encoders and probably their morale. The next day, when Atlas drove back for its final run, it made it out of the vehicle and through the door effortlessly. But half way through the obstacle course, it lost its balance and slammed to the ground again. In the end, MIT's Atlas didn't win the challenge. But its falls in the race made robots, as a mechanical species, more relatable and less apocalyptic. Having empathy for robots isn't an issue for everyone, though. "How could you not like robots? That's like saying you don't like puppies," said Tedrake. "Some people are worked up about robots taking our jobs or the apocalypse. We're far from that...[but] the technology has come to a point, where robots can work outside of a machine factory. They're able to get out and do meaningful work."